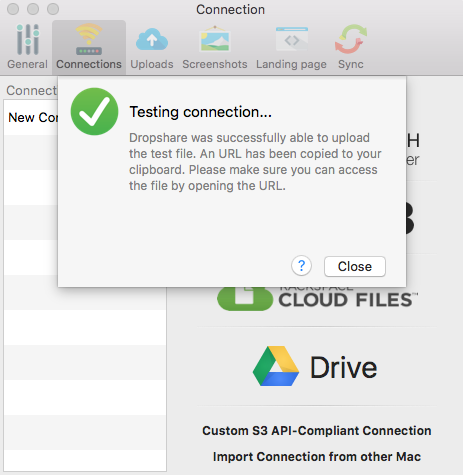 Dropshare is a so-called menulet for OS X that enables you to easily 'drag & drop' files, folders, and anything else to your own server, DreamObjects, or other cloud services. 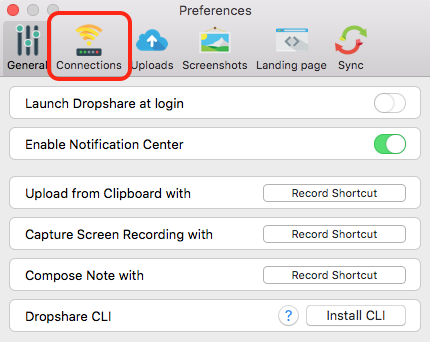 Once you upload a file, the app copies the link to the file to your Mac’s clipboard, which allows you to easily share it with anyone. Before you begin, you'll need to create a bucket on the DreamObjects page. Download the latest release from the Dropshare site. Launch Dropshare, and then click the Dropshare menulet to expand the app. Click the gear icon and go to Preferences. Click the ‘Connections’ menu item in the Preferences pane. 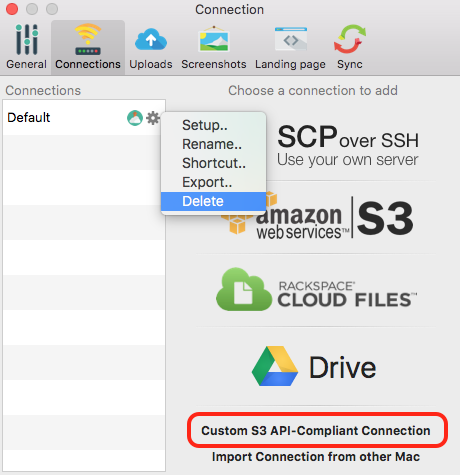 Delete the default SCP connection, then click Custom S3 API-Compliant Connection to create a DreamObjects connection. Enter your DreamObjects Bucket name, Access Key, and Secret Key. Visit the DreamObjects keys article for details. Enter objects-us-east-1.dream.io into the Server field. 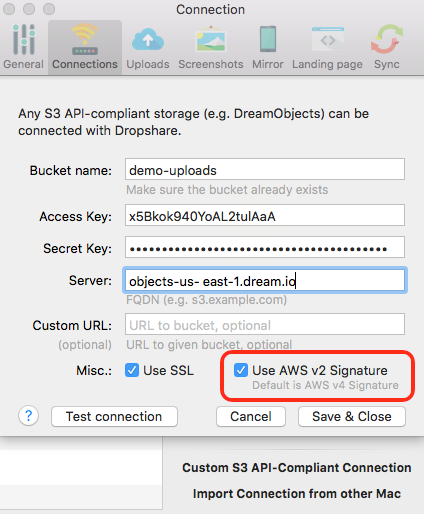 Check the boxes for Use SSL and Use AWS v2 Signature. When finished entering your DreamObjects credentials, click the Test connection button. Open a browser window and paste the URL into the address bar. 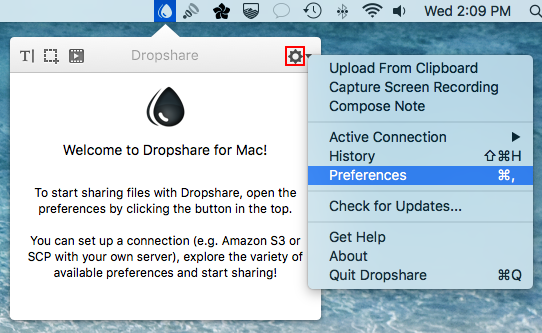 Return to the Dropshare Preferences pane. When finished, click the Save & Close button to close the Preferences pane. 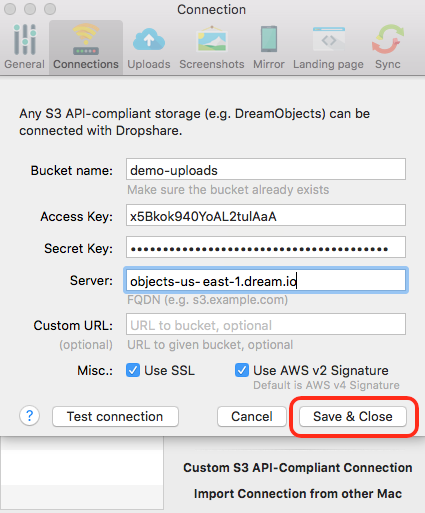 Dropshare is now configured for use with your DreamObjects bucket.